Maps show above and the globe image are produced or provided by professional cartographer Angus Weller who lives on Vancouver Island, Canada - see also CityOfNanaimo.com Mr. Weller's home town. Additional graphics and text on the map were added with permission from Weller Cartographic Services by N. Chan, ManusIsland.com website designer. 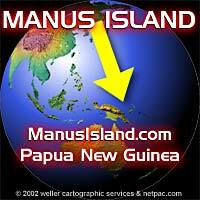 The map to the left, the globe above and the Map of whole of New Guinea below gives different perspectives as to the location of Manus Island / Manus Province within Papua New Guinea generally and to Indonesia to the west and north and to Australia to the South West. For a full map of Papua New Guinea in Adobe Acrobat TM PDF format see papuan.pdf This is about 123 k. download and assumes you have the Acrobat plugin set up with your web-browser. For those of you new to .PDF documents, they have a nice ability for viewers to zoom in / zoom out and in some cases, text within the document can be "searched for".